1 of 3 Heat grill to medium-high heat. In a blender, combine avocado, buttermilk, basil, 1/4 cup water, lime juice, salt and 1 tablespoon of the olive oil. Blend until smooth. Transfer to a bowl, cover and set aside. 2 of 3 Slice tomatoes as desired; arrange on a large platter. Skewer shrimp. Brush grill lightly with oil. Grill shrimp 2 to 3 minutes per side or until pink and cooked through. Halve each piece of French bread lengthwise; brush cut sides with remaining 1 tablespoon olive oil. Grill bread cut-side down for 2 minutes. 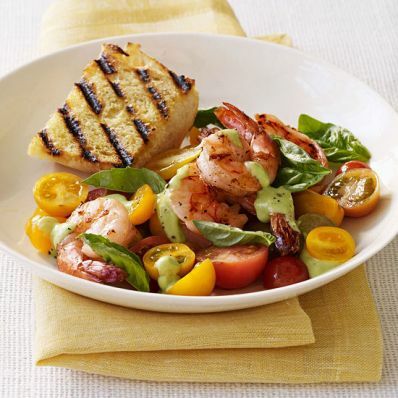 3 of 3 Remove shrimp from skewers and scatter over sliced tomatoes. Drizzle half the avocado-basil dressing on tomatoes and shrimp; garnish with basil leaves and season with fresh cracked pepper, if desired. Serve remaining dressing on the side, along with grilled bread.